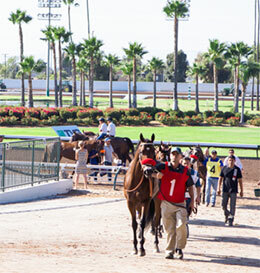 Saturday’s Los Alamitos Race Course card will feature nine top juveniles competing in the sixth race at 300 yards. LOS ALAMITOS, CA—APRIL 11, 2019—The top 2-year-olds in Quarter Horse racing are now in action on a nightly basis at Los Alamitos. Saturday’s card will feature nine top juveniles competing in the sixth race at 300 yards. The field is headed by George and Ruben Villalobos’ homebred Corona Required, who they repurchased for $140,000 at the Los Alamitos Equine Sale last year. The colt by Corona Cartel is out of No Tools Required, the dam of Restricted Grade 1 winner One Hot Mecanic and Los Alamitos Maiden Stakes winner Required Fire. She’s also the mother of multiple Grade 1 stakes finalist Firing Tools. To be ridden by Jairo Rangel for trainer Jose Flores, Corona Required has looked great in workouts. He posted a fourth fastest of 26 drills (:12.50) on March 16 and then returned with the second fastest of 52 works (:12.20) on March 30. The field will also feature a pair of EG High Desert Farms runners in Corona Lake and El Angel Corona. They looked good when working as a tandem in a time of :12.30 on March 30. Jesus Avila’s Handsome TD, a gelding by Tempting Dash and out of 2008 Grade 1 Southwest Juvenile Championship winner Brenda Beautiful, will start from the rail in this race. The seventh race on the card is an $11,525 allowance event featuring six older horses. Baldomar Aguilar’s Devil In A Blue Suit, who posted a half-length victory as the even money favorite on December 30, will make his 2019 debut in this event. Jose Pantoja and Jorge Silva’s Ray Donovan also figures to contend, but he’s had an up-and-down season. He hit the gate and was bumped on the way to running seventh in his last start on March 29. Prior to that effort, he flew right from the start and posted a terrific 1-¼ length win. Blanca Marquez Granados’ Sepertist Dash, who beat the aforementioned Ray Donovan by a head as the favorite in an allowance event back on February 8, draws the outside post and is another top contender in this race.